The H.H. Rogers Walking Tours started out in a big way last week with a group of about 30 from the Cape coming on Tuesday. It was the Chatham Walkers who came to enjoy a walk before going to lunch at one of our nearby restaurants. They were joined by a few other members of the general public on a beautiful late spring day. On Thursday, there was a smaller group, but it was another fine morning for walking. The Rogers tours will continue every Tuesday and Thursday morning through the end of September. They start outside the Town Hall, 40 Center Street, at 10:00 a.m. Under usual circumstances Bob Foster guides the Tuesday morning tours and I guide the Thursday ones. If it’s rainy the tours are cancelled. They are free of charge and there is no need to register in advance (though the Chatham Walkers did call ahead, because they are a larger group). Also last Thursday a group of vintage car owners were here for a tour of the center. You may have seen their cars in the morning. Jumping in at the last moment, volunteer Gail Costello was on hand outside the Town Hall to hand out Visitors Guides and point out the local attractions. Thank you Gail! 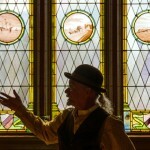 Another volunteer has been prepar­ing to guide Riverside Cemetery walking tours. Joanne Zych has been a Visitors Center volunteer on Friday mornings. 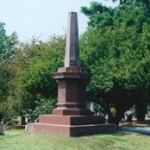 In addition, she has volun­teered to guide some of the evening cemetery tours. Last Saturday, I walked through Riverside with Joanne to hear her version of the tour. It’s a bit different than my own tour, but full of information about the most prominent burial sites in the cemetery. Joanne will be guiding her tour for the public on Wednesday, June 20, at 6:00 p.m. The tour starts near the white house/office just inside the main gates of Riverside. This tour includes hills and uneven ground; be sure to wear comfortable walking shoes. Also note there are no public restrooms at Riverside Cemetery. The Pirates and Privateers presenta­tions at Fort Phoenix are now underway. They are held every Friday morning, weather permitting, near the fort cannons. 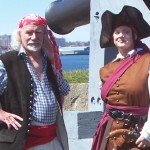 Abby Black, Andrew the Powder Monkey and Greybeard put on a family friendly show about pirates and Revolu­tionary War privateers along with Fort Phoenix history. There are stories, demonstrations and the firing of a small swivel cannon to end things with a bang. All ages enjoy this presentation. 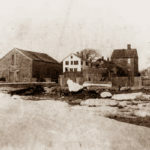 On Friday, June 15, all the Acushnet third graders will see it, and next Monday all the 5th graders from Mattapoisett’s Old Hammondtown School will visit the fort. We’ll also be putting on one program for the Rec Center’s Kool Kids summer program. It’s free, so stop by for some history-tainment! 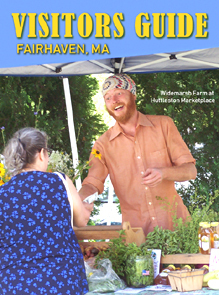 After many months of planning, the Huttleston Marketplace will begin on Saturday, June 16, running from 10:00 a.m. to 4:00 p.m. on the lawn of the Visitors Center, 141 Main Street, directly next to Fairhaven High School. I first started developing this idea last October with a poll on Facebook about what people would like to see happening on Saturdays. The top vote getters were “arts & crafts” and “antiques and collectibles.” So the market will have all of those, along with farm fresh produce, eggs, honey, locally produced food products, baked goods and more. On opening day we should have 30 booths set up. The Huttleston Marketplace will be open every Saturday through Septem­ber 1, except June 30. There will be a different variety of vendors each week, though about half are schedule to be on hand all season. You can visit http://FairhavenTours.com/hutteston-marketplace for details. One of the biggest annual events in town will take place this Sunday, June 17. That’s the annual Father’s Day Road Race, which attracts hundreds and hundreds of runners from all over New England. You can sign up until Saturday afternoon. There are no sign-ups on the day of the race. The race will begin at 9:00 a.m.
For more information go to http://www.fairhavenroadrace.org/. The Road Race Committee donates a lot of the proceeds from the race to worthy community groups. On Sunday, June 24, a new private Farmers Market gets underway at 151 Alden Road, at the yellow farm stand next to National Bleach. This will run from 11:00 to 3:00 and continue each Sunday until the end of October. The Homecoming Day Fair is Saturday, June 30, from 10:00 a.m. to 4:00 p.m. along Center Street. As usual there will be arts and crafts, food, fire engine rides, and much socializing as friends return to town for the fair or for one of the FHS class reunions scheduled for that weekend. The Fairhaven High School Alumni Association will hold two tours of the high school, guided by Bob Foster. They are scheduled for 10:00 and 12:00 and begin inside the main entrance of the school. The Historical Society will have the museum open in the Academy Building during the day and I’ll be at the Visitors Center, so stop by and say hello. And I should mention the following week there will be the 4th of July Car Cruise, the 4th of July Parade and the Fort Phoenix Independence Day ceremony with the firing of the cannons! The Lions Club is actively looking for parade participants —walkers, floats, etc., from individuals or businesses. You can contact Bill Moniz at 508-996-3420 for info about being in the parade. Until next month, remember that I welcome your comments or sugges­tions. You can contact me via email at [email protected], by calling 508-979-4085, or by stopping by the Visitors Center, 141 Main Street. The hours of the Office of Tourism are Monday, Tuesday, Thurs­day, Friday, and Saturday, 8:00 a.m. to 4:30 p.m., with a half-hour break around noon. There are some reserved parking spaces in the high school lot closest to the Academy Building.